Gythrun Castle is the third largest of the mainland settlements in the Kingdom of Melderyn. It is the principal seat of the Earl of Biren and the center of economic activity for Birenshire. The town is a major stopover for caravans on the Nuem Trail and attracts significant maritime trade. For both moral and economic reasons, Gythrun has found itself embroiled in the Solora Crusade, a campaign of subjugation being waged against the Solori tribal nation by the Order of the Lady of Paladins, a fighting order of Larani, the goddess of chivalry and battle. The Gythrun article describes the town's history, government, religion, and economics. It provides details for some of the settlement's craftsmen and other locations, as well as an in-depth description of the Solora Crusade. It includes full-color GM and player maps as well as floor plans for Caer Gythrun, the main stronghold of the Earl of Biren. 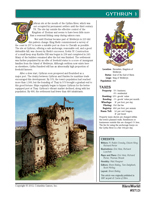 This is a Hârn Classic article and was originally published in 1987 as part of Castles of Hârn.